We understand the importance of offering homeowners a wide variety of exterior home improvement products and services, which is why we offer everything from roofing in Jackson, MS to siding in Richland, MS and all of the surrounding areas. Not only do we believe in the importance of offering varied products and services to our customers, we also believe that these products and services must be of the highest quality in order to ensure the satisfaction of our clients. Whether we are tasked with a sizable project relating to metal roofing in Jackson, MS, or a small installation of gutters in Jackson, MS or Clinton, MS, we always take the quality of our work very seriously. Regardless of your exterior home improvement needs, we here at Complete Exteriors, LLC are always able to offer expert assistance. We are proud to say that we are a family-owned and operated business that spans multiple generations. Since Complete Exteriors, LLC was founded, we have been dedicated to providing customers with the best possible products and services, installed by knowledgeable and courteous crews who care a great deal about the quality of work they consistently deliver. Joe is a Graduate of Northern Michigan University with a Degree in Building Construction Management. Joe’s love for Construction guided him to opening his Own Company in 2007. He’s Married with 3 Children. Joe is an active member in his Church, Coaches his Son’s Football Team, and enjoys Duck Hunting. Allen has 20+ years of experience in the Construction Industry of which he’s Mastered Many Trades. Allen is originally from Naples, Florida. His experience in the Industry and Extensive Knowledge of Products and Applications gives him a leading edge on Sales. Allen is a Family Man who enjoys boating, fishing, and hunting. Erik has 20+ years in the Roofing Industry. He’s Originally from New York and has lived in Mississippi for the past 3 years. Erik’s Extensive knowledge in the Roofing Industry makes him a Master in Roofing Practices and Procedures. Erik is the Assistant Coach for his Son’s Baseball Team. Christine is a Graduate of Michigan State University with a degree in Interior Design and a Minor in Building Construction Management. Christine is Originally from Rochester Hills, Michigan and has lived in Mississippi for the past 6 years. Christine Manages the day to day operations of the Office and Oversees Projects when the need arises. She has 4 Children and spends most of her free time shuttling them from Marching Band, Dance, Archery, Baseball and Softball practices. 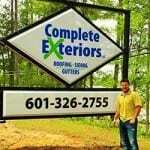 Complete Exteriors LLC is a Family Owned and Operated Company. Complete Exteriors is a Licensed, Bonded, and Insured General Contractor that specializes in all of your Roofing and Siding needs. We’re a Certified Roofing Contractor, which only 3% of Roofing Contractors in North America have achieved this status. This achievement allows us to offer a Lifetime Warranty on Qualifying Roofing Systems. We’re also the ONLY James Hardie Preferred Remodeler in the State of Mississippi. Complete Exteriors has extensive knowledge in Insurance Claims and will work directly with your Insurance Company to ensure you get the most value for your claim. We’ve been the Angie’s List Super Service Award Winner for 2011, 2012, and 2013. If you are in need of any of our exterior home improvement services, please give us a call at (601) 326-2755 or use our convenient online request form. We are capable of handling any work that you may be in need of – whether it is vinyl siding in Florence, MS, gutters in Clinton, MS, or residential roofing in Brandon, MS. We have the necessary knowledge and expertise to make sure that the job is done right each and every time.